Get in the habit of starting the day with a tandem walk. 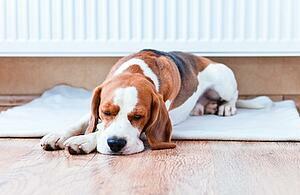 Burning some energy off first thing in the morning will leave Fido too tired to get into trouble at home. Our Springs communities have on-site off-leash dog parks that are convenient for quick exercise sessions. Adopting a second dog or a compatible cat gives your pooch a companion to help pass the time. A second pet is a big commitment, so if that's not feasible, schedule some play dates with a friend's dog. 3. Create a "Doggie Cave"
A crate or pen makes a nice retreat for your dog that keeps him out of trouble. Make it comfortable with blankets, pillows, toys and water so he sees the crate as an enjoyable place to be, not a punishment. Please note that a dog shouldn't be kept in a crate for more than four hours at a time. If you choose this solution, make sure that you or a trusted friend can come by at least once a day for a break. Many dogs, especially puppies, amuse themselves by chewing anything they can get their paws on. Get down on your hands and knees and check for objects that may offer too much temptation for a bored pet. Don't forget to consider any houseplants that are toxic to dogs. Hearing human voices can be soothing, so leave the TV or radio on. If you choose a radio, select a talk station rather than a music station. Keep your dog mentally sharp by leaving treat-filled KONG dispenser toys that provide an exciting challenge to solve. Fill the toys with DOGSBUTTER, a healthy and natural alternative to peanut butter. Leave the blinds open on a window or sliding glass door so your dog can see what's going on. Make it more comfortable by placing a cushion or pillow where he can sit. If your dog has a tendency to bark, you may want to skip this one. Don't leave any toys or objects around that are small enough to pose choking hazards. It's essential to ensure that your dog has plenty of clean drinking water available. Dog water fountains hold sufficient quantities and add an element of fun. Do you have a friend or family member who can stop by periodically to give your dog some companionship? Another option is taking your pet to doggie day care, either on a regular basis or as an occasional "vacation." Our pet-friendly Springs communities include amenities specially designed for dogs, such as off-leash parks and pet spas. Stop by and see why Springs luxury apartments make the perfect home for you and your precious pet.